Maybe she hasn&apos;t quite pulled a Zellweger, but Olivia Munn sure looks different lately. “Being multi-ethnic―I’m half Chinese, half white―brings up a whole set of complications that people don’t even think about when it comes to being photographed. I have more of a white appearance on the outside, but my bone structure is very much Asian. I have high cheekbones and smaller eyes. When you put shimmer on the inside of my eyes, I immediately look cross-eyed. If you put too heavy of an eyelash on me, it looks like my eyes are halfway closed.When your face changes because of makeup, it’s hard to let people know that you’re not actually doing surgery or fillers…"
Weight loss: "I lost 12 pounds this past year while training for X-Men. The weight loss leaned out my cheeks and jawline." Brows: "I do my own brows and always thought they were supposed to have a high arch. Then a facialist pointed out to me that I was shaping my brows into a frown. So I let the top of my brows grow in... and then I plucked the bottom. That gave my brows a more horizontal angle and instantly brightened my eyes." Pigmentation: "I love my freckles. But over the past couple of years I&apos;ve seen more come up and merge with other freckles to make large dark spots. Dark spots prevent your skin from reflecting light and gives you a dull complexion. So for the past year I&apos;ve been diligently using Proactiv mark-fading pads. I wipe my face with one every night and now my face has a more even tone and the large spots aren&apos;t as noticeable." Potatoes: ""I&apos;ve talked about this before and I still stand by it: Japanese potatoes that are high in hyaluronic acid help keep wrinkles away. Look up this video: &apos;Connie Chung Yuzihara&apos; to learn all about it. There are hyaluronic acid pills and vitamins but I think that the best way to get it in your system is by eating them in foods that naturally have them." Olivia Munn at the 2006 premiere of &apos;Beerfest&apos;. Back in 2006, Olivia was a pretty, fresh-faced 26-year-old with freckles, lip gloss and loose waves. She had a much fuller face back then, but didn&apos;t we all? Also note her hooded eyes. Olivia Munn at the 2008 premiere of &apos;Nobel Son&apos;. In 2008, her hair was much longer, and she started playing with shimmery shadow tones around her eyes (which have now become her signature). Olivia Munn at the 2009 Scream Awards. The following year, her styling took on a much more "Hollywood" feel. Hence, the on-trend side bun, fluttery false lashes and burnished gold eyeshadow. Her face seems a little slimmer, but that&apos;s natural as you lose your baby fat (she was 29 here). It could also be the lighting or the hairstyle. Olivia Munn at the 2010 Grammy Awards. Then we arrive in 2010, and even though Olivia&apos;s wearing a similar hairstyle to the last shot, her face looks different (rounder) again. It could be the angle, lighting or weight gain—although if you see her head-to-toe, she was by no means overweight here. Her eyes still have the heavy lids, with a natural brow shape. Olivia Munn at the 2011 Entertainment Weekly and Women in Film pre-Emmy party. Here, you can see how when Olivia slightly angles her face away from the camera, it has a very lengthening effect. She looks much more bronzed, with angular eyebrows and cool purple eyeshadow concentrated under the eyes. Her bottom lip looks fuller, but that&apos;s because of the lip liner faking a shadow underneath the lower lip. Overall, très glam! Olivia Munn at the 2012 Vanity Fair Oscar party. Now we&apos;re in 2012, and I still don&apos;t think Olivia touched her face. In this rare camera-facing pose, it&apos;s evident she still has the same rounded/pear shape. A new wavy lob, heavier eye makeup and sharper, fuller brows give her a grown-up look. Also spot the lower lip liner, again. Olivia Munn at the 2013 Hollywood Film Awards. Then Olivia started growing her hair out; this textured mid-length style definitely softens the angles of her jawline. Her brows and lashes are stronger than ever before, which really opens up her eyes. I still think she&apos;s au naturel here. Olivia Munn at the 2014 Guys&apos; Choice Awards. This 2014 shot, from when Olivia was 34 years old, is the last "natural" one, in my opinion. The long, sleek, shiny hair has a face-slimming effect—although she&apos;s also not smiling as broadly here, which could account for the narrower look. Olivia Munn at a 2015 Samsung launch. Olivia Munn at the SiriusXM set at the 2016 Super Bowl. The first evidence I could find of Olivia&apos;s new look was this shot from early in the year. I mean... wow! I don&apos;t doubt she lost weight filming X-Men, but her jawline is clearly very different. Also her lips—they are much fuller! And her skin—where are the freckles? I can see what she was talking about with regards to her brows; I agree that the softer, straighter shape is more flattering. Olivia Munn at the 2016 Academy Awards. However, it wasn&apos;t until Olivia stepped out at the Oscars that people really took notice. Again, her jawline is much narrower and rounded, her eyes are more open, and her lips are unmistakably fuller. I&apos;m sad she got rid of her freckles! Olivia Munn at the 2016 Saturn Awards. Funny how Olivia used to always show her teeth, but now has switched to closed-mouth smiles. The freckles look like they&apos;ve come back a little, maybe because it&apos;s summertime? I just can&apos;t get over how she went from a round/pear face shape to a full-fledged oval! Olivia Munn at the 2017 CFDA Awards. Alright, the freckles are back! Olivia looks super-summery here, with fresh skin, bright lipstick and a top knot. Her eyes look more open again, and I think there&apos;s filler in her upper lip (as it&apos;s uneven). Olivia Munn at the 2018 Critics&apos; Choice Awards. Now, Olivia looks more glamorous than ever. She&apos;s 37 at this point, and I really like how she&apos;s dialled back the makeup and is wearing her hair super-long. In this shot, we can definitely see the filler injected into her upper lip. Also, one of her eyes seems to be drooping a little... which sometimes happens with Botox! 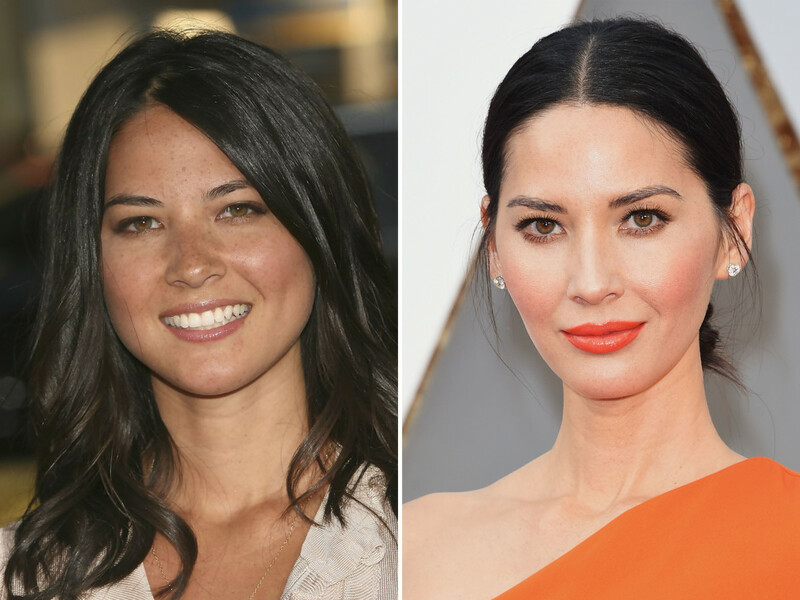 Olivia Munn in 2006 (left) and in 2016 (right). I don&apos;t know about you, but I think Olivia doth protest too much. She says she lost weight, changed her eyebrow shape, started acid toning and eating these hyaluronic acid potatoes. Fine. I believe her. And as someone who reports on celebrity beauty, I can appreciate the transformative effects of makeup better than most people. But STILL—I suspect she&apos;s omitting important information that really accounts for her new look! Here&apos;s my theory. I think her first procedure was some kind of eye lift, which can be done via blepheropasty or even by lifting the brows with Botox. Since the latter would wear off with time, that might account for why her brows look higher in some of the photos. I also think she probably had Botox injections in her jawline to weaken her masseter (chewing) muscles. This is what Bethenny Frankel recently admitted to, and probably Renée Zellweger had it done, as well. As for her lips, I can&apos;t see how that&apos;s not Restylane filler. Her freckles, it&apos;s possible she faded with the glycolic and salicylic acids in Proactiv+ Mark Correcting Pads (for which she is a spokesperson). But when you have the budget for laser resurfacing procedures, that seems a bit more likely, no? Surprisingly, the one thing I&apos;m pretty sure she didn&apos;t do is get a nose job—unlike 99 percent of Hollywood. So I guess there&apos;s that! I just think it would&apos;ve been better if she&apos;d either a) said nothing about her new look, or b) fully owned her cosmetic procedures, instead of giving us half-truths and pushing the skincare company she&apos;s paid to promote. How do you feel about Olivia&apos;s beauty evolution?